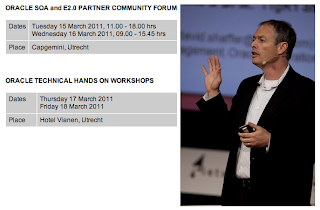 Thanks to Oracle SOA Community (kudos to Jürgen Kress), Oracle technology professionals can participate in SOA and E2.0 Partner Community Forum XIII. During this highly informative event you can learn about partner success stories, participate in an array of break out sessions, exchange information with other partners and enjoy a vibrant panel discussion. Additionally to the SOA and E2.0 Partner Community Forum, you can participate in technical hands on workshops on March 17th and 18th. The goal of these workshops is to prepare you for customer implementations.